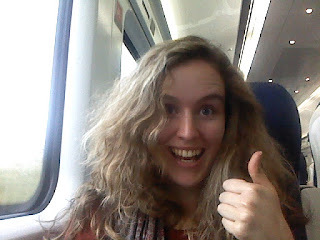 Travel Pennies: They have WiFi on trains now?! They have WiFi on trains now?! I actually think this has been the case for some time, and I'm just slow. It used to be just on the Cork - Dublin trains, but now it's on every Sligo - Dublin one too! Completely free, very quick and all you have to do is sign up with them. I'm telling you, the three hour journey can be a killer. By the time you've read your magazine, watched a few episodes of 30 Rock and listened into some very excellent granny conversations, you look at your watch and realise that only 14 minutes have passed. It's a KILLER. But now, the internet is here! To add at least 7 more minutes to your time officially killed! Brilliant. I'm off to Dublin before a flight to Bournemouth tomorrow. Originally I'd planned to get the train on the morning of the flight, but then I figured I would have only made it in time if every aspect of the journey had run perfectly on time. Which, of course, it would have had I not needed it to. But we all remember the Dublin Airport Drama from earlier in the year. My heart couldn't have taken that kind of pressure again. So a day in Dublin it is. I wish I could say some culture was involved... but we both know it's just going to involve shopping and Queen of Tarts.